I want someone else to bake this Moro bread so we can discuss. It's stunningly easy if you have a mixer. This is the third batch, and it's better than almost any bread I've ever baked, and I've baked a lot of bread. The recipe below is true to the book, but I've added slightly more salt. I've left the metric measurements in because I fear conversions might jinx the excellent results, so you'll need a scale. I hope someone tries it and tells me what they think. 1. Dissolve 1 teaspoon yeast in 125 ml. tepid water. 2. In the bowl of a mixer, combine 2 1/2 teaspoons kosher salt, 700 ml. tepid water, 1 kg. bread flour (or plain), and the yeasty water. Mix until smooth and elastic. It will be too wet to handle. 3. Oil 2 bread pans and sprinkle with flour. Pour in the dough. You'll need a rubber spatula to ease it into the pans. 4. Cover with a damp towel and let rise for 3-5 hours or until doubled. 5. Heat oven to 450. Bake loaves for 30 minutes, then remove from the pans and bake on the oven rack for 15 minutes more. The crust on this bread is hard and crackly, and when you slice there are biggish bubble holes. The flavor and chewy texture are, in my opinion, perfect, like the best artisanal bread but in sandwich-friendly loaf form. 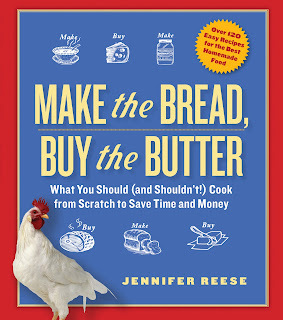 And it's simpler than Mark Bittman/Jim Lahey no-knead bread because you don't have to think a day ahead. In future, I might increase the salt even more, and try to omit the flouring of the pans. I also wonder if you really need a separate step for dissolving the yeast. My sister-in-law, Amy, is visiting and we have spent a lot of time talking about food, though we come at it from very different perspectives. She's writing her dissertation on food in women's prisons, but she is not, herself, a cook. She said, "I feel about cooking like I do about skiing. I don't care if I can ski, and I really don't care if I can cook." She goes to Stop & Shop and buys the same reliably tasty things every week-- chicken, veggie burgers, pre-made pesto, pre-crumbled goat cheese, and then comes home and assembles it. I, on the other hand, spend untold hours obsessing about what I'm going to cook and then cooking it. Is this perhaps the reason that I, unlike Amy, will never have a PhD? For dinner, I served the Moro's version of harira, a classic North African soup that includes a lamb shank, lots of vegetables, turmeric, chickpeas and lentils. Moro: "We always imagine the name of this soup being spoken with a guttural Islamic tongue, and being eaten without ceremony at the edge of a busy bus stations somewhere in Morocco. The flavours of the spices and coriander are very evocative, and only the bus fumes are missing. " Malaga raisin ice cream was a fiasco. I had frozen some heavy cream a while back, defrosted it for the ice cream, thought it looked a bit grainy but since it tasted okay went ahead and used it. Lesson: don't ever do this. When churned, this ice cream contained little flecks of hard butter. "You shouldn't have told me!" said Amy. "I thought those were tiny white chocolate chips." In other news, my mother is very sick. I don't know how to weave this into my goofy food blog, and the idea of trying to do so makes me way too sad. But if I'm going to keep writing a blog that is any way honest, I can't pretend it's not happening. I'll just leave it at that for now. I accept your bread challenge and offer my condolences on your mother's difficulties. Hope she has a turnaround soon. Positive thoughts for you and your mother in this difficult time. I hope she recovers soon. sorry for babbling. again, all my best wishes! I'm sorry to hear you mother is not well. All my best most positive wishes to you and your family. I've really been wanting to bake bread lately, but I can't find my loaf pans. One of those stupid mislabeled box in the move things. They're hanging out in the garage with my pie plate and angel food cake pan. All the best to your mother. I would love to make this, but alas I don't have a scale. Conversions would be welcomed. Love the "you shouldn't have told me!" quote. Hate hearing about your mom but glad you are keeping it honest. I really hope she improves soon. ISO a stand mixer. Sounds like too much for my little handheld one. I have been enjoying every post on your blog since I began reading it last March. I can fantasize about trying new dishes around your table, drinking lots of wine -- just like the old days. We miss you guys! The bubbles make that bread look like sourdough. I'll give it a try, although I don't have a scale either. I'll have to look up conversions. So sorry to hear about your mother's illness. Best wishes to her and the family. I may try that also this weekend, but I already have to make rice krispie treats, with the unmentionable bag of marshmallows, for my son who is going back to college on Sunday. I think the warm water and yeast, sometimes a little sugar is added, is called proofing and makes sure that your yeast is still "alive". P.S. saying a prayer for your mom. I get so much pleasure from reading your blog; I wish I could return the favor. The best I can do is... I'm holding good thoughts for you and your mom. Regarding cooking, I actually enjoy reading and thinking about cooking more than actually cooking. In law school, I'm embarrassed to admit that I grocery shopped at the 7-Eleven at the end of my urban block. I bought mostly cereal, milk, bread, tuna, mayonnaise, apples and diet coke (um, and Cheetos). Currently, my husband, a truely wonderful cook, makes all of the household meals. I will bake on special occasions and cook if he works late. But mostly, I just watch food shows, read food blogs and buy cookbooks -- but don't actually make anything out of them. This probably says something negative about my character, but I'm not sure what. Thinking good thoughts for you mother. Hope she is doing better soon. Hurray! I am so glad you agree with me, Anonymous. I find it completely mysterious that such a simple recipe makes such a great bread. What brand of kosher salt are you using, Tipsy? Apparently the two major ones are not the same volume. Though are they the same, weight-wise? I made it today too, and it is great! But i used the conversions you gave and the dough was not sticky, it was easy to handle. Also, i agree that it needs more salt. Anonymous 5:06: the recipe in the book calls for sea salt, but I don't have any, so I used Diamond brand kosher. They don't weigh the salt in the recipe. i made it too, minor screwups on timing were involved that will require a redo, but I did find the interior somewhat gummy? what do you think, did I pull it out too soon? Christopher -- I don't know! You may have pulled it out too soon. That has always been my problem with bread, though not with this recipe. (The "sounds hollow" rule doesn't work for me.) If you weighed your ingredients, it probably is a timing issue. Frustrating. A tip for the scale-less: Buy the flour from the store's bulk department, if possible. They will have scales there (preferably digital ones), and even if they don't, your receipt will show you how much you bought and give you something to work with. If the Moro bread recipe calls for fine sea salt and you're using Diamond Kosher salt, you need to use twice the amount of salt by volume because of the larger crystals in that brand. That's why your bread tasted undersalted. To substitute kosher salt for table (or fine sea) salt in recipes, use 1.5 times the amount of Morton kosher salt, or 2 times the amount of Diamond Crystal kosher salt. I like to use kosher salt in cooking, but for baking I use fine sea salt, because it measures by volume the same as table salt, which is what most baking recipes call for. The fine sea salt doesn't have the nasty chemical taste of table salt and also frees me from having to do that kosher salt math conversion. Bulk sea salt is cheap, too. Honest Cook -- THANK YOU. I had no idea and I will proceed accordingly. I'm so glad you told me this because I've been lazily using kosher salt for everything for years. I was timidly raising the salt content in the bread by increments, but next time will do it boldly and scientifically. I've been making the "Artisan Bread in 5 Minutes a Day" for the past year, with great success. I tried the Moro bread recipe, using the metric measurements. Measuring flour with a scale was surprisingly satisfying. The results were phenomenal. The loaves look underwhelming, but the crust and texture are amazing. I baked them on my somewhat charred baking stone in the bottom of my oven for the last 15 minutes, rather than on the rack. I would watch more carefully next time to make sure I didn't burn the bottoms, but it worked out. The loaves had a little bit of char on the bottom without being actually burned. I am a convert. Just wanted to say that we've been enjoying this bread recipe. It's my go-to for sandwich bread now. Thanks for posting this! I've made it a few times now, and I find that about 1 tablespoon + 1 teaspoon may be around the right amount of salt. Curious how much you're using these days. I was also wondering about the "mix until smooth and elastic" line. How long does it usually take for you with this recipe, and do you mix by hand or in a stand mixer? How do you test doneness with such a wet dough? I haven't been able to pull off the windowpane test with this one. Stupid question, but here goes: I just got a vintage KA mixer (Hobart era!) and I think this bread will be the inaugural recipe. It will also be my first attempt at baking bread. Which attachment do I use? Is it okay to just use the paddle attachment or does it need to be the dough hook? I thrifted my mixer and it only came with one attachment. I haven't looked for the other ones yet...Thanks for any advice.